Michelle likes me to read her the same Bear in the Big Blue House book every night before she goes to sleep. It's a book about going sleep and I've added an interactive element to the story. I ask her a question after reading each page. Did you have a snack tonight? Did you have a bath tonight with lots of soap and bubbles? Did you put your pyjamas on? Did you read a bedtime story? Did you fluff your pillow? Did you pull up your covers to your chin? Did you turn out the lights and say goodnight? That's all good, but we always stumble with the first question. Bear and the gang like to have a bedtime snack, so I ask Michelle if she had a snack tonight. She usually answers in the negative because treats and snacks, in her two year old mind, are two very different things. Snacks are crackers, cheese, apples and bananas. After dinner, she usually gets a cookie. Cookies are not snacks, they're treats. I might alter the question so it includes treats because sometimes a snack is not a snack. 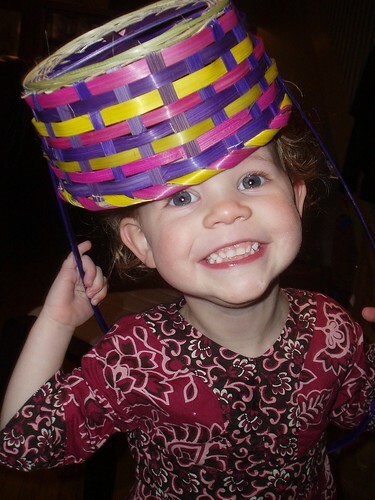 Sometimes a snack is not a snack, but a basket can always be a hat! Michelle is Royalty at its best. Bring it on Queen Michelle!